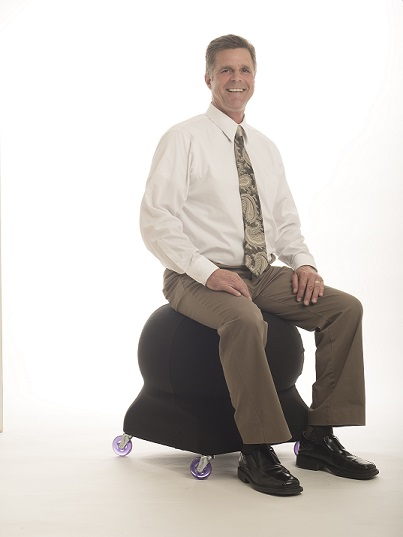 The Evolution Chair’s all-inclusive Kit includes risers to adjust the base height for correct ergonomic positioning, a sta-ble smooth rolling base for safety and great maneuverability, a comfortable anti-burst ball, a workout exercise poster, and pump for inflation. The Evolution Chair’s back-less base design engages your core, the ball naturally encourages proper spinal alignment and relieves spinal compression and compact rolling base allows you to flow effortlessly throughout your work station. You may not have a choice in sitting all day; you do have a choice what you sit on. Switch from a conventional seat to the Evolution Chair and you’ll know the benefits are worth the sit!